This post has been updated with an announcement from Gov. Roy Cooper. For more than a year, environmental and citizens’ groups have battled against the Atlantic Coast Pipeline. But today, the NC Department of Environmental Quality granted a key permit that will allow the project to begin its 160-mile route through the state. DEQ’s Division of Water Resources announced today that it is approving the 401 water quality permit after eight months’ of review. 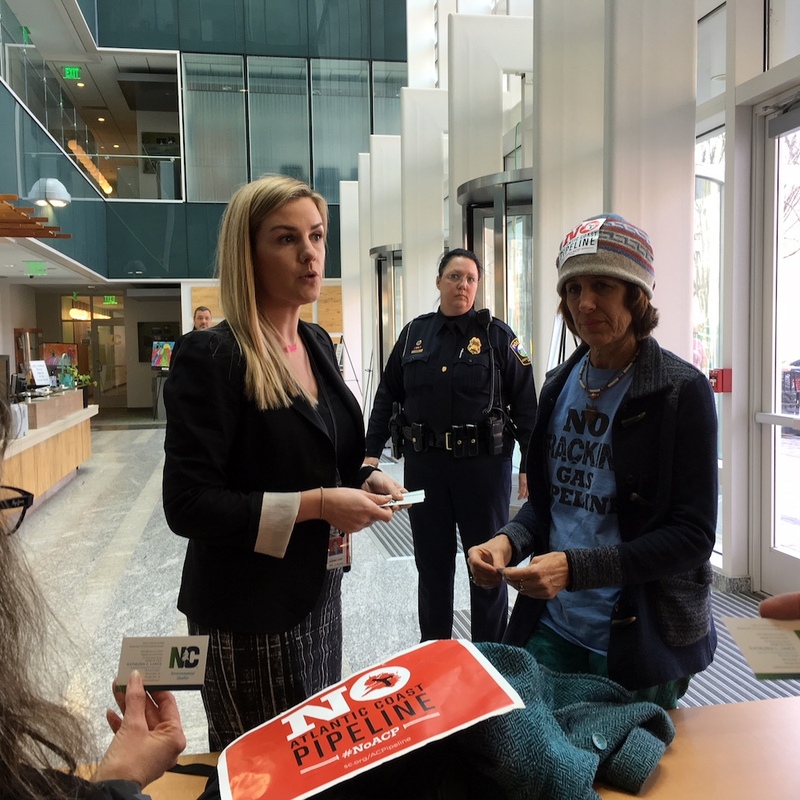 DWR had asked for additional information five times before finalizing the permit. Duke Energy co-owns the Atlantic Coast Pipeline with Dominion Energy. The pipeline will begin at a fracking operation in West Virginia, continue through Virginia and North Carolina, and possibly extend through South Carolina. The backlash against the pipeline was instantaneous. Appalachian Voices, Clean Water for North Carolina and the Blue Ridge Environmental Defense League issued a statement calling for another round of public comment on the latest information released by the utilities. Policy Watch reported yesterday that Duke Energy was becoming impatient with the permitting process. The utility had approached Gov. Cooper’s office about the permitting process; although there were rumors that Duke had implied it would sue if the permits weren’t granted, the governor’s office said there was no threat of litigation. Asked by Policy Watch if it planned to sue unless the project was green-lighted, Duke dodged the question. Natural gas, it should be noted, while cleaner than coal, emits methane. And methane contributes to climate change even more than carbon dioxide. Funds can also be used to ensure that local communities benefit economically from the pipeline by having have access to natural gas from the pipeline, Cooper’s office said. But having access does not mean that local communities can afford to connect to the the main line or offshoots; connections can run thousands of dollars and even more for commercial and industrial customers. Adams of Appalachian Voices lambasted Cooper for what appears to be a quid pro quo. DEQ laid out several requirements in the 401 permit. They include a different method of cutting into the Neuse River, part of which the pipeline would cross. ACP, LLC had suggested two methods — open trenching and a cofferdam — that essentially would have interrupted stream flow in part of the river during construction. It also would have required contractors to try to catch and relocate the Neuse River Waterdog, a threatened species of salamander native to the Neuse and the Pamlico-Tar river basins. Stream and wetland monitoring: Restored areas must be monitored for three years with photo documentation. DEQ may extend monitoring requirements. Unless an exemption is granted for a specific location, all stream-crossing construction must be conducted “using best practices” to divert water and limit potential sediment pollution. Horizontal directional drill: To better protect the Neuse River and its riparian buffers, the project must use a horizontal directional drill for crossing the waterway. Documentation of drilling components: The composition and properties of drilling fluids and additives for each horizontal directional drilling crossing must be submitted to DEQ and will be available online for public access. Well testing: Private well testing will be required before and after construction within 150 feet of the disturbed area or 500 feet from blasting areas. Testing after impacts must be conducted by an independent qualified groundwater specialist. Regular inspections: DEQ water resources and erosion control staff will conduct monthly onsite inspections of pipeline construction activities. Construction stormwater protections: Though not required by state or federal regulations, the project will obtain coverage of and meet the requirements of the state’s construction stormwater permit for the entire construction corridor in North Carolina. Thousands of citizens along the eight-county route oppose the project, speaking out at public forums, submitting comments on the environmental impact statements and holding rallies. In addition to the environmental damage to rivers, streams and wetlands, they are concerned about air emissions, the impact of natural gas production on climate change, and environmental justice issues. The pipeline largely runs through low-income neighborhoods and communities of color. 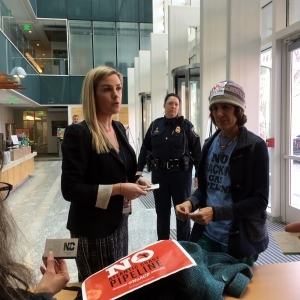 “Many of us commented extensively to DEQ that there was no way a 401 certificate could be legally granted, in light of all the damage this pipeline would unavoidably cause,” said Martha Girolami of the Chatham Research Group. The supporters were generally economic development directors and some local government officials, who said they believed the pipeline would help bring new industry and jobs to eastern North Carolina. However, it’s unclear if ACP, LLC’s economic promises will be fulfilled. In North Carolina, most of the natural gas — which will be used to power Duke’s power plants. And since Dominion insinuated last fall that the pipeline could route through South Carolina to the coast, environmental groups have theorized that some of the gas could be exported. However, no documents have been publicly filed with federal regulators for a South Carolina extension. The Federal Energy Regulatory Commission approved the project Oct. 13, 2017, also despite widespread opposition. Several permits still must be granted before project construction can begin: the air quality permit for a compressor station in Northampton County, two general stormwater permits in Nash and Cumberland counties, an individual stormwater permit in Cumberland County, and the erosion and sediment control plan for the northern part of the North Carolina route. The project also must obtain a 404 water quality permit from the US Army Corps of Engineers for stream and wetland impacts. Cooper is impressive – he openly receives graft from Duke and no one cares – nothing to see here – no coziness – NC Policy Watch is fine with this? This goes to show that money talks…” We the people “ don’t have a say in this.